The two stars spill on what they share with their breakout characters in “The Story of Yanxi Palace”. 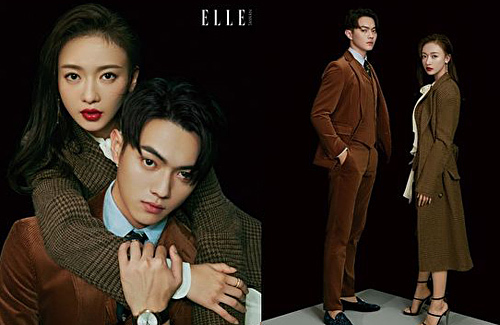 Gracing the cover of Elle magazine, the two breakout stars of The Story of Yanxi Palace <延禧攻略> share more about finding stardom and what drives them. As the two actors were the least experienced in the entire cast of Yanxi Palace, there were many times when they felt jittery at the thought of stalling senior actors with their outtakes. Though the cast told them it was okay, after a few outtakes Xu Kai made sure he went back and made a great effort of memorizing his lines, to the extent that he even dreamed about them. Yanxi Palace’s astounding success transformed both their lives. As someone who dislikes taking breaks, Jinyan got used to an average of five hours of sleep every day and hardly has any time to go out with friends. For Xu Kai who loves basketball and gaming, he now returns home straight to bed, and a layer of dust has even settled on his beloved computer! Indeed, Xu Kai and Jinyan’s common career trajectories of seemingly overnight stardom makes each the perfect person to understand the other. Long before becoming an actress, Jinyan was a young girl who was determined to become a ballerina at The Affiliated Secondary School of the acclaimed Beijing Dance Academy. However, a series of injuries and later a serious bone fracture left her with little choice but to give up. This however made her tougher than many other girls her age. As her career turning point, the role of Wei Yingluo is also Wu’s self-professed most significant role to-date, opening up more choices for her career and greater autonomy as an actress. He understands that every Mainland Chinese actor who wishes to make it big puts in his or her best. Adding that Yanxi Palace’s success has made him busier and more fulfilled, he acknowledges the pressure and responsibilities which he said “reflects the audience’s affirmation of him” as an actor. Ready to take on any challenges ahead, he does not mind the accompanying hardships.